1. Too many parents these days can't say no. As a result, they find themselves raising 'children' who respond greedily to the advertisements aimed right at them. Even getting what they want doesn't satisfy some kids; they only want more. Now, a growing number of psychologists, educators and parents think it's time to stop the madness and start teaching kids about what's really important: values like hard work, contentment, honesty and compassion. The struggle to set limits has never been tougher ‒ and the stakes have never been higher. One recent study of adults who were overindulged as children, paints a discouraging picture of their future: when given too much too soon, they grow up to be adults who have difficulty coping with life's disappointments. They also have distorted sense of entitlement that gets in the way of success in the work place and in relationships. 2. Psychologists say that parents who overindulge their kids, set them up to be more vulnerable to future anxiety and depression. Today's parents themselves raised on values of thrift and self-sacrifice, grew up in a culture where no was a household word. Today's kids want much more, partly because there is so much more to want. The oldest members of this generation were born in the late 1980s, just as PCs and video games were making their assault on the family room. They think of MP3 players and flat screen TV as essential utilities, and they have developed strategies to get them. One survey of teenagers found that when they crave for something new, most expect to ask nine times before their parents give in. By every measure, parents are shelling out record amounts. In the heat of this buying blitz, even parents who desperately need to say no find themselves reaching for their credit cards. 3. Today's parents aren't equipped to deal with the problem. Many of them, raised in the 1960s and '70s, swore they'd act differently from their parents and have closer relationships with their own children. Many even wear the same designer clothes as their kids and listen to the same music. And they work more hours; at the end of a long week, it's tempting to buy peace with 'yes' and not mar precious family time with conflict. Anxiety about future is another factor. How do well intentioned parents say no to all the sports gear and arts and language lessons they believe will help their kids thrive in an increasingly competitive world? Experts agree: too much love won't spoil a child. Too few limits will. 4. What parents need to find, is a balance between the advantages of an affluent society and the critical life lessons that come from waiting, saving and working hard to achieve goals. That search for balance has to start early. Children need limits on their behaviour because they feel better and more secure when they live within a secured structure. Older children learn self-control by watching how others, especially parents act. Learning how to overcome challenges is essential to becoming a successful adult. Few parents ask kids to do chores. They think their kids are already overburdened by social and academic pressures. Every individual can be of service to others, and life has meaning beyond one's own immediate happiness. That means parents eager to teach values have to take a long, hard look at their own. (1) What values do parents and teachers want children to learn? (2) What are the results of giving the children too much too soon? (3) Why do today's children want more? (4) What is the balance which the parents need to have in today's world? (5) What is the necessity to set limits for children? (1) Teachers and parents want children to learn values like hard work, contentment, honesty and compassion. (2) When children are given too much too soon, they grow up to be adults who have difficulty coping with life's disappointments. Such children may develop a distorted sense of entitlement that hampers their success in the work place and in relationships. (3) Today's children want more because there is so much more to want. Moreover, they consider luxurious items as essential utilities. (4) In today's world, parents need to strike a balance between the advantages of an affluent society and the critical life lessons that come from waiting, saving and working hard to achieve goals. (5) There is a need to set limits for children because they feel better and more secure when they live within a secured structure. 1. I remember my childhood as being generally happy and can recall experiencing some of the most carefree times of my life. But I can also remember, even more vividly, moments of being deeply frightened. As a child, I was truly terrified of the dark and getting lost. These fears were very real and caused me some extremely uncomfortable moments. 2. Maybe it was the strange way things looked and sounded in my familiar room at night that scared me so much. There was never total darkness, but a street light or passing car lights made clothes hung over a chair take on the shape of an unknown beast. Out of the corner of my eye, I saw curtains move when there was no breeze. A tiny creak in the floor would sound a hundred times louder than in the daylight and my imagination would take over, creating burglars and monsters. Darkness always made me feel helpless. My heart would pound and I would lie very still so that 'the enemy' wouldn't discover me. 3. Another childhood fear of mine was that I would get lost, especially on the way home from school. Every morning, I got on the school bus right near my home ‒ that was no problem. After school, though, when all the buses were lined up along the curve, I was terrified that I would get on the wrong one and be taken to some unfamiliar neighbourhood. I would scan the bus for the faces of my friends, make sure that the bus driver was the same one that had been there in the morning, and even then ask the others over and over again to be sure I was in the right bus. On school or family trips to an amusement park or a museum, I wouldn't let the leaders out of my sight. And of course, I was never very adventurous when it came to taking walks or hikes because I would go only where I was sure I would never get lost. 4. Perhaps, one of the worst fears I had as a child was that of not being liked or accepted by others. First of all, I was quite shy. Secondly, I worried constantly about my looks, thinking people wouldn't like me because I was too fat or wore braces. I tried to wear 'the right clothes' and had intense arguments with my mother over the importance of wearing flats instead of saddled shoes to school. Being popular was very important to me then and the fear of not being liked was a powerful one. 5. One of the processes of evolving from a child to an adult is being able to recognise and overcome our fears. I have learnt that darkness does not have to take on a life of its own, that others can help me when I am lost and that friendliness and sincerity will encourage people to like me. Understanding the things that scared us as children helps to cope with our lives as adults. (a) On the basis of your reading of the above passage, make notes using headings and subheadings. Use recognizable abbreviations wherever necessary. (b) Make a summary of the passage in not more than 80 words using the notes made and also suggest a suitable title. My childhood was generally happy and had carefree moments. However, darkness scared me with its shadows, unexpected movement of curtains and creaking sounds. It made me feel helpless and I used to lie still, with a pounding heart. I was scared of getting lost. Before boarding my school bus, I scanned it for familiar faces. I was shy and afraid of not being liked by others. As I evolved from a child to an adult, I realised that understanding things that scared us as a child help in coping with life. You want to sell off your car as you are leaving the country. Draft a suitable advertisement to be inserted in 'The Hindu'. Write the advertisement in not more than 50 words. Public taps are always faulty and a lot of water is wasted. 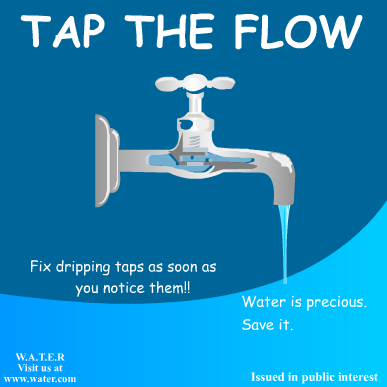 Design a poster in not more than 50 words to make people aware of the need for saving water. You are Rohan/Rohini. Available for sale a two-year-old white Toyuki car in pristine condition. The car has two fuel options and gives great mileage. Interested buyers may contact immediately on 9xxxxxxxxx as the owner is leaving the country in May. Price negotiable. As an active member of the Interact Club of your school, you had participated in a summer camp organized by the Lions Club of your district. Write a report on the camp and its activities in 125 − 150 words. You are Gyan/Geeta of XYZ Public School, Rohini, Delhi. You are the Sports Captain of your school. The annual sports were conducted last month. Write a report in 125 − 150 words on the conduct of the same. You are Manish/Mita of PQR School, Mall Road, Amritsar. India is a country which has always respected women. Write an article in 150−200 words on 'Status of Women in Free India'. You are Ravi/Reena. Mahatma Gandhi once said, "I regard the English language as an open window for peeping into western thought and science." Write an article in 150 − 200 words on 'The Usefulness of the English Language in India'. You are Navin/Naina. (a) Who is the aunt mentioned here? (b) Why is she 'ringed with ordeals'? (c) What is the difference between her and the tigers? (a) What was the poet's childhood fear? (b) Why were the poet's parting words? (c) What is the poetic device used in these lines? (a) What change does the poet hope for in the lives of the slum children? (b) How do beautiful things help us to live a happy life? (c) What symbol from nature does the poet use to prove that keeping quiet is not total inactivity? (a) Why did Gandhiji oppose when his friend Andrews offered to stay in Champaran and help the peasants? (b) What was the content of the letter written by the peddler to Edla? (c) Why had the rag pickers come to live in Seemapuri? (d) What shows M. Hamel's love for the French language? (e) How did the Dewan manage to get the 100th tiger for the Maharaja? (f) Why did Jo feel that the skunk's mommy was stupid? (g) What comic incident did Bama narrate to her brother? Why was he not amused? Douglas fully realized the truth of Roosevelt's statement 'All we have to fear is fear itself'. How did this realization help him brush aside his fear and become an expert swimmer? How did the negligence of the prison officers prove to be a boon for Evans? Read the following and answer the question that follows in about 100 words. Sophie was a dreamer. The lesson 'Going Places' reminds us that mere dreams will not help us to accomplish anything. What qualities, do you think, would help Sophie to realize her dreams?